MAN IN BLACK: Welcome once again, friends, to another exciting… Tale from the Borderlands!!! Starring that cunning, curvaceous Camilla of combat… Lilith J Leapomeyer! When we last left our lovely leading lady, she was having some difficulty keeping her most recent manservant, Brick, in one place for any period of time. Ditching the fleet-footed fool at the first sleazy bar she could find, our habilable heroine enlisted the help of a young soldier by the name of Roland. Join them now as they discover mystery, excitement, and danger in... 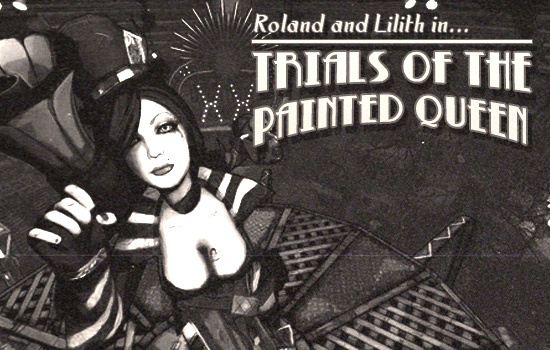 The Trials of the Painted Queen! THE PAINTED QUEEN: Ha ha ha ha! Welcome travelers to my fabulous UNDERDOME OF PAIN! Do you like what I’ve done with the place? TPQ: Attack them my pretties! MAN IN BLACK: From out-of-nowhere, a pack of perverse, preposterous pygmies attack our heroes, leaving them little time to formulate a plan of attack. Our vocally vexed veteran, Roland, once managed to slay a swarm of spiderants and only lost one toe! MAN IN BLACK: With this war cry, Roland charges at the labrose, lanate Lilliputians and valiantly begins shooting them. Stunned for only a moment by this strange sight, our heroine engages her Extra Planar Saunter technique and maneuvers her way behind the bevy of bantams to launch a surprise sneak attack. Against such an incredible force, the diminutive disputants quickly fall. TPQ: Ha ha ha ha ha! You oblivious obambulates! That was only the first round! MAN IN BLACK: Will our heroes manage to make it out of the trials alive? Will Roland ever get those provocative, piquant pastries that he pines for? Will our hesychastic heroine of the homomerous hair ever be allowed to finish a complete thought? Tune in next time for another exciting and death defying… TALE FROM THE BORDERLANDS!!!! Page created in 0.2534 seconds.